Another year, another trip to Chattanooga! After arriving in Chattanooga around 11:30, we made our first stop at High Point Climbing Gym on Broad Street. 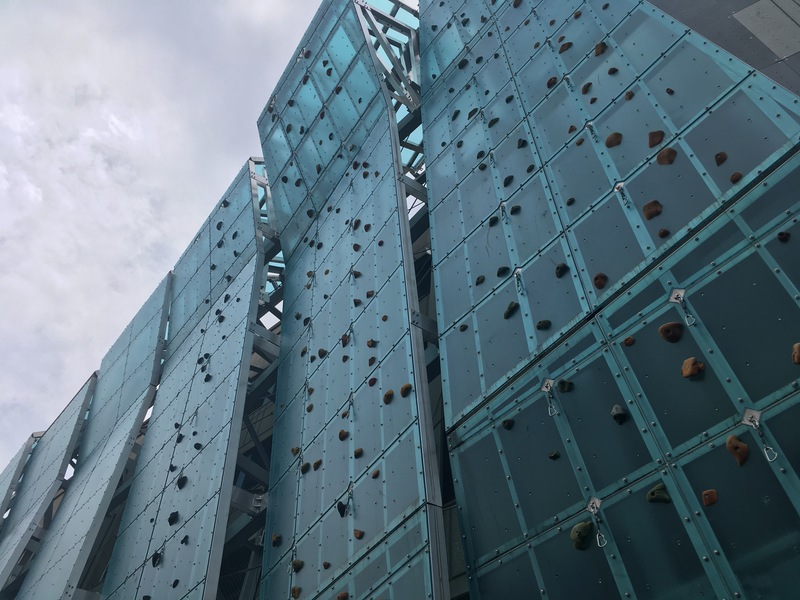 The gym features an outdoor wall on the outside of the building which looked cool, but the insane humidity kept us inside for all of our climbing. 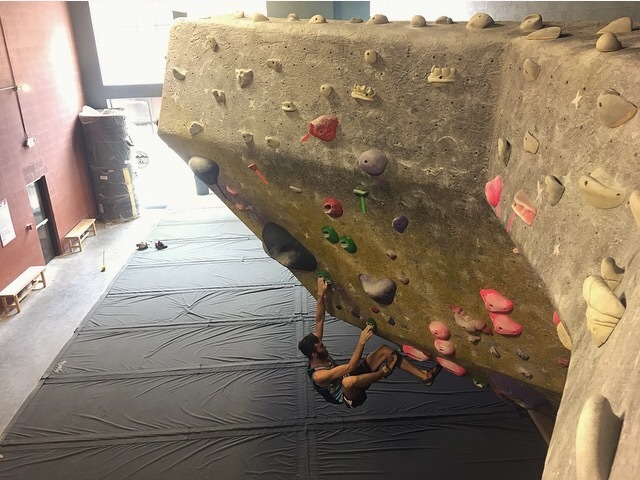 One of the high points (pun intended) of the gym was their top out boulders, where you actually finish the route by climbing on top of the bouldering structure! 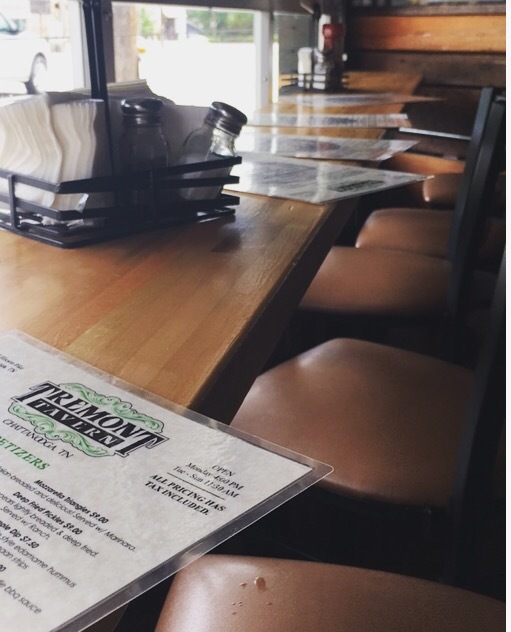 After a few solid hours of climbing, we popped in next door to Rock/Creek to browse some Patagonia and Prana gear, and then we headed to Tremont Tavern per the recommendation of one of the climbing gym employees. We snagged some window seats to people watch and planned the rest of the day while chowing down on a havarti burger (him), a hummus wrap (me), and some killer tater tots (both). After lunch, we headed over to nearby Frazier Avenue to check out Chad’s Records (which is now located inside Winder Binder). They offer lots of vintage records and books, and you’ll probably be greeted by the friendly resident dog who I remember from my visit last year. 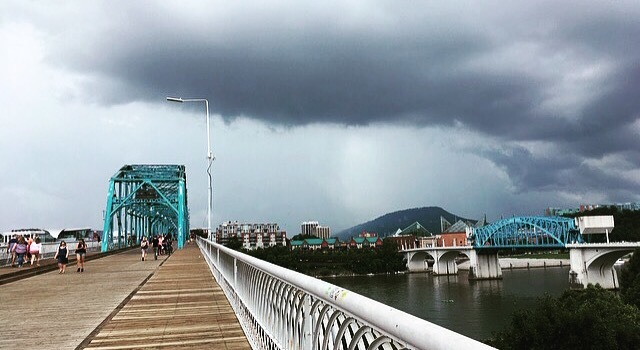 After noticing some incoming rainclouds, we quickly made our way to Walnut Street Bridge to take in the view before the storm hit. Although it’s almost always packed with tourists, the bridge is a cool spot to get a panoramic view of the city and watch the brave souls who continued kayaking and paddle boarding in the face of an impending thunderstorm. As it started to sprinkle, we stopped by Revelator Coffee Company, a super spacious and minimalistic coffee spot with yummy espresso. Our final stop was Clumpies Ice Cream Co. which had a wide variety of both classic and crazy flavors (salted watermelon anyone?). They even had dairy-free options! On our way out of Chattanooga, we took a drive up W Road to check out Signal Mountain. Unfortunately, due to some poor navigation on my part, we only caught a couple views along the way, but the drive up was still fun (albeit pretty stressful given the crazy sharp turns – it’s called W Road for a reason!). All in all, it was another lovely day spent in Chattanooga. There are always new spots to discover and adventures to embark on, and I can’t wait for my next visit!